Although professional photography studios already crowded the Japanese treaty port of Yokohama by the 1870s, William Henry Metcalf (1821-1892) was one of the first intrepid amateur photographers who brought his own camera on his trans-Pacific trip to Japan. More than a decade before portable Kodak cameras ushered in a new era of amateur photography, Metcalf commissioned his friend and fellow photographer Henry Hamilton Bennet (1843-1908) to construct a portable travel camera, equipped with both photographic and stereoscopic lenses. Arriving in Yokohama in June 1877 with the pioneering “Japanologist” Edward Sylvester Morse (1838-1925), Metcalf set out on a four-month tour photographing the Japanese landscape. More than two dozen of his stereographic photographs were consigned for publication by Bennet under the title “A Summer in Japan” and promoted to a ready market in the US hungry for imagery of the exotic Orient. Metcalf’s image of the Daibutsu (Great Buddha) of Kamakura was not the first published stereoview card of this popular tourist attraction, yet it remains an early attempt at capturing the ancient bronze behemoth with this new and increasingly popular photographic technique. It also presages the immense popularity of this subject for the stereographic trade of the late nineteenth and early twentieth centuries, when it became a staple image among the sets of Japan views issued by the larger publishers, such as Underwood, Graves, and White. Metcalf’s image is uncommon among contemporary photographs of the Daibutsu in that it captures the scene devoid of people, casting visual focus on the serene countenance of the statue and its bucolic setting. More typically, people, oftentimes children, would be included in the shot to establish the sheer grandeur of the statue, but here the viewer is left to his or her own devices to estimate the size and dimensions. Moreover, by removing visitors from the scene, Metcalf was able to facilitate a more immediate encounter between the viewer and religious icon, creating a silent space to ponder the meaning of such a picturesque portrait. For more on Metcalf’s travels and photography see Gartlin 2010. 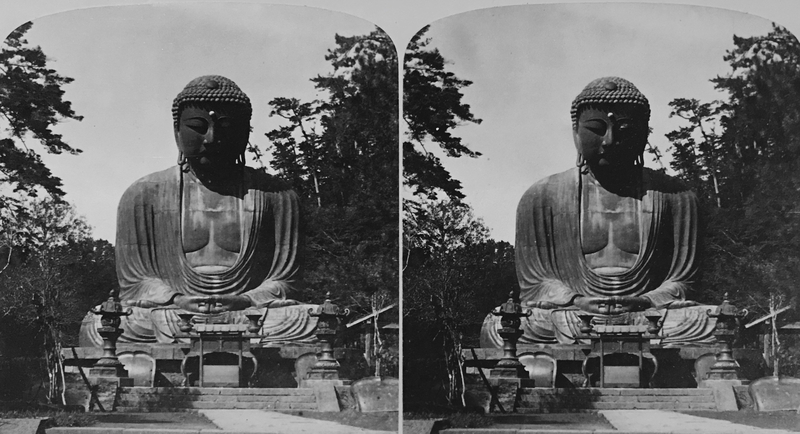 I am aware of at least two older stereoview cards bearing the image of the Kamakura Daibutsu, one photographed by Charles Weed and published in San Francisco by Thomas Houseworth & Co. in 1869, and one published internationally under several titles by Wilhelm Burger, also in 1869. (A image of Burger’s stereoview card can be found in the Database of Old Japanese Photographs in the Nagasaki University Library Collection.) For more informaiton on these sets, see Bennett 2006. Gartlan, Luke. 2010. “Japan Day by Day? William Henry Metcalf, Edward Sylvester Morse and Early Tourist Photography in Japan,” Early Popular Visual Culture, Vol. 8, No. 2, pp. 125–146.